What he means is that Suresh Raina is still there to rescue the innings and everything will be fine. And on many occasions Raina has successfully saved the team the blushes and often won matches, either in the company of his captain and motivator Mahendra Singh Dhoni or almost single handed. The unassuming Raina’s super 100 (75 balls, 12 fours, 3 sixes) in the second ODI at Cardiff could not have come at a better or a more appropriate time. The Test series having been surrendered meekly, India needed to do something special in the One-day series to salvage some pride. With the English captain choosing to field, India had to make a big score to put the hosts under pressure and try to go one-up in the series, the first ODI having been washed out. And it was Raina who provided the impetus after a pretty slow start by Rohit Sharma (52 off 87 balls) and cheap dismissals of Shikhar Dhawan (11) and out-of-form Virat Kohli (0). Though it was an ODI and there were restrictions on bowlers, Raina’s handling of the English pacemen, particularly James Anderson, who had terrorised the Indian batsmen in the Test series, was quite exemplary. With a visibly renewed confidence and vigour, and a bit of change in his technique and approach to the game, the southpaw appeared to be a completely different batsman than his image of one vulnerable against short, rising deliveries. If anything, he never allowed Anderson or any other bowler to dominate him. It was Raina at his best, flourishing once again in the inspiring company of Dhoni at the other end. Raina’s perfect timing, his bold, booming shots and his sustained attack on the English bowlers may have dealt a psychological blow to the hosts, who not only came a cropper in the third ODI, too, but were also found wanting to check him until he himself contrived his own dismissal (42 off 42 balls with 5 fours) in order to complete his 50 and finish off the game. With two back-to-back brilliant match-winning knocks, Raina has not just proved that he is a kingpin in Dhoni’s scheme of things in shorter versions but also made many English critics wonder why he was not in the Test team. It is at once a tribute to Raina’s talent, who had a torrid time in the Tests in England in 2011 after scoring a fine 120 on debut against Sri Lanka at Colombo in July 2010. Raina, who could not hold on to his place in the Test team despite getting opportunities, has now a good a chance of making a comeback against the West Indies in October. However he will have to face a stiff competition as there are quite a few contenders for the No. 6 position if the Indian team management decides to play half-a-dozen batsmen. But, realistically, Raina is presently more required in ODIs and Twenty20s than Tests. 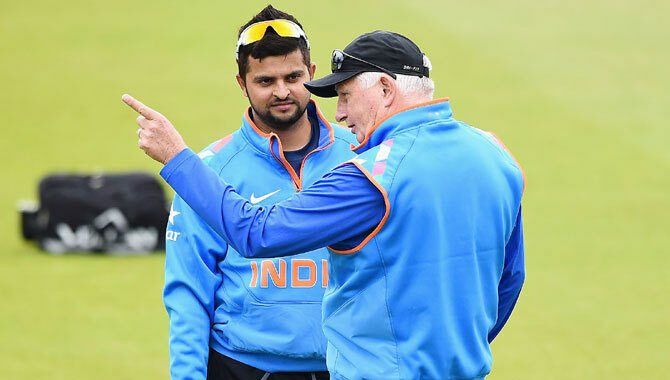 “There is a marked change in Raina’s game. He looks more confident, more determined and more watchful. He looks surer of his shot selection, both against fast bowlers and spinners, than ever before,” says former India wicketkeeper Nayan Mongia. Not only Raina’s confidence, his concentration has also improved a great deal without curbing his natural game or basic instinct to go for his shots. Getting dropped from the team for a while has done him good as he could work on his footwork and think about making some adjustment in his technique. Doubtless, former India batsman Praveen Amre has played a definite role in the rejuvenation of the hard-working Raina, who is a livewire on the field, both when batting and fielding. There are few better sights in the shorter versions when Raina is in full flow and timing his shots perfectly and hitting the ball with the meat of the bat both in the off and on side. He is even more attractive when he sends the ball soaring over the boundary and smashes towering sixes in the on side. It is no exaggeration to say that Raina is the scourge of spinners and a captain thinks twice before pitting them against him when he is in a murderous mood. Raina is one of the few batsmen who has scored a century in all the three formats of international cricket, a no mean feat. And the most endearing quality about the left-hander is that he invariably excels in adversity. In fact, it has become a cliché of sorts that the greater the pressure, the brighter the chances of Raina coming good. He is decidedly one of the best finishers in the game today. His electric, panther-like fielding not only inspires his teammates but also saves some crucial runs, which often prove decisive in the end. The bubbling Raina is always ready to sacrifice anything for the sake of his team -- his wicket in order to make a few quicker runs or to save a more settled batsman in the event of a freaky run-out situation. Though he personally likes to bat at No. 5, he is ever-willing to bat anywhere in the order, depending on the team’s situation. He is also among the first to cheer and congratulate a teammate who may have taken a wicket or held a catch. Indeed, there are many virtues to admire in Raina, not just one or two. There really cannot be a better teamman than Raina. At nearly 28 (born November 27, 1986), he may appear to have achieved a lot. In fact, he has: 4805 runs (4 centuries, 29 half-centuries) at 35.85 in 176 ODI innings with an impressive strike rate of 92.27; 922 runs (1 century, 3 half-centuries) at 32.92 in 37 Twenty20 international innings with a strike rate of 135.78; and also 768 runs (1 century, 7 half-centuries) in 17 Tests. But, surely, his best is yet to come. And if he has reserved his best for India’s defence of the 50-over World Cup title in the Antipodes early next year, nothing can be better and sweeter. He is much experienced now, fully mature and it will be great if he unfolds his true genius in the game’s greatest show. Meanwhile, you can be rest assured that Raina will continue to spread lustre with his sunshine cricket and scintillating batting, now that he has made a smashing comeback.